Now that I finally have a job that I love, I’m starting to see so many positive changes in my life. My blog is growing, I’m happier, and just feel more fulfilled. I hadn’t realized how much my not-so-great job was affecting my life. Not only was I uninspired and defeated at my job, but that feeling also made its way into other parts of my life. Luckily, I made a change for myself, but there were many times when I thought staying where I was uncomfortable (no matter how miserable) was best for me. If you’re feeling like this, it’s probably time to make a change. Now, I know that we all don’t want to get out of bed, no matter what. Even at my new job, I struggle with getting up. But, this struggle is a little different than before. I used to roll out of bed with barely enough time to get ready and not give a crap about how I looked. I didn’t care about my job, so I didn’t care about my appearance. That was the case pretty much wherever I went. I’m a person who loves dressing up and makeup, but I had no interest in doing those things for this job. Now, I dress up everyday and throw on my best-winged liner. Why? Because I care more about my job and that translates into my appearance. I want to look good because I feel good. Not just at work! You spend as much time at work as you do at home. So, why would you want to be someplace that you dread? We all get the Sunday blues, but if you’re plotting ways to get out of work the night before, it’s time to go. You want to work somewhere that you feel content at the very least. You may never feel as happy as when you’re home, but that should be a goal! I always want to perform and do my best work, but when I’m feeling miserable, it’s much harder. The way you feel about your job affects your work. I feel like I’m doing much better work now that I like my job! Work that I am proud of and put my all into. If you feel like you’re just cruising on mediocre work, you may need to find something more inspiring. Being miserable for 40 hours a week can take a toll on who you are as a person. At my last job, I would come home so tired, stressed, and worn out that I barely did anything outside of sitting on my couch and watching TV. Now, I work on my blog just as much as I do anything else. I work out consistently, which was hard to find motivation for when I was unfulfilled. I’m reading more books, hanging out with friends, and going to networking events to better myself. Your job should inspire you to be the best and improve your skills. My current job constantly has those goals in mind for their employees and in turn makes me want to improve in all aspects of my life. I talked a little bit about how I cared very little about my appearance when I disliked where I worked, but that lazy attitude also affected my self-worth. When you feel unappreciated, unworthy, and just miserable, you start to feel that about yourself. Like most women in our society, my self-esteem has never been 100%. However, pairing that with a crappy job just makes you feel worse. You shouldn’t feel stuck at your job or like you aren’t worth more money or a higher job satisfaction. Remember: YOU ARE WORTH IT! You just have to figure that out and find a better place. This is an official apology to everyone that I have been super crabby with over the last few years. I was so much more irritable back then and ALWAYS complaining about my job. Thank you to everyone who had to put up with it all. My mood has drastically improved since, which I’ve heard from multiple people. I am happy in my job and that reflects in other parts of my life. I’m not so angry and annoyed by simple things as I used to be. Not only has my mood improved, but I also feel more energetic. My physical, mental, and even creative energy have all improved since leaving a job that was draining all of that out of me. If you feel like a ticking time bomb at work and home, you may be overstressed and underpaid. Time to send out some resumes! 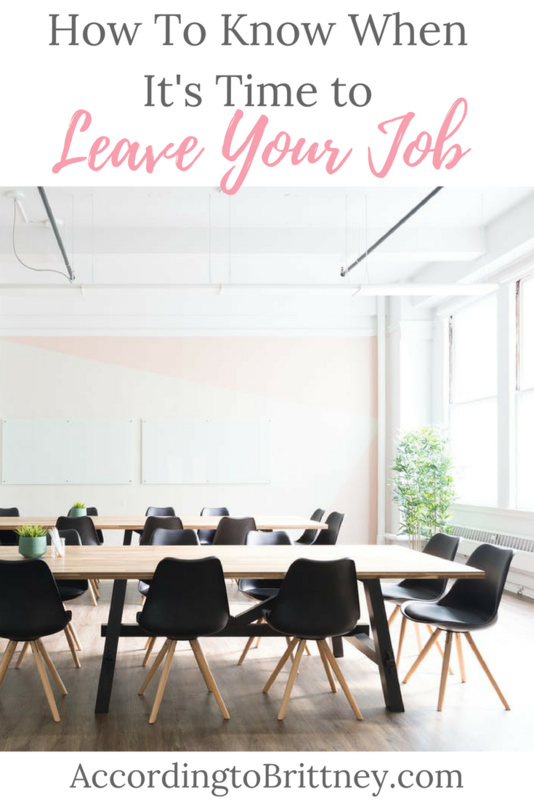 Your job should not take a toll on your personal life. Take some time evaluate your job, your skills, and what will make you a happier person. What parts of your job helped you realize that it was time for a change? Comment below!